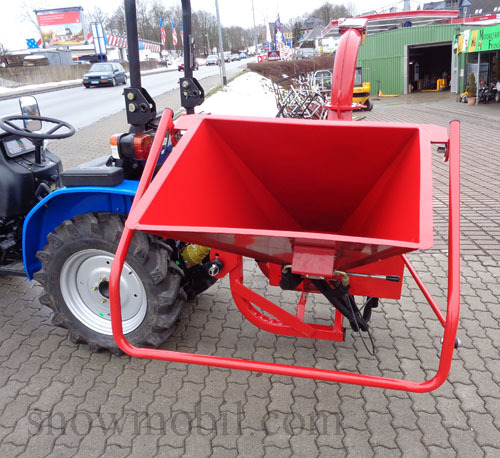 1.990,00 EUR 19 % VAT incl. 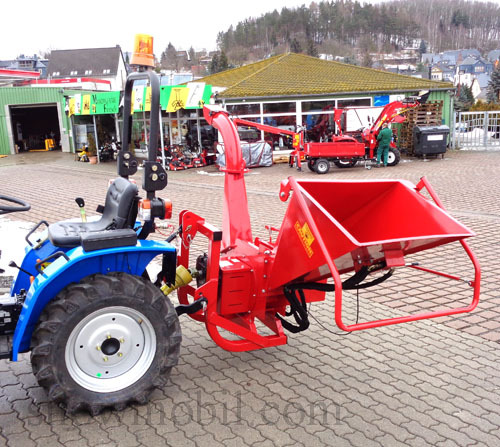 A mini tractor with at least 14.0 ps and a rear three point linkage KATI or KATII and a standard PTO with 540 rpm clockwise is recommended. 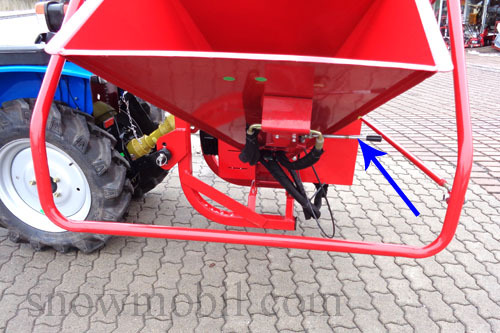 If you stand at the feed hopper and pull the strap to yourself, then increases the roll feed speed. Press the bow away from yourself, the roll feed speed is continuously reduced. Press on, then stop the feed roller. 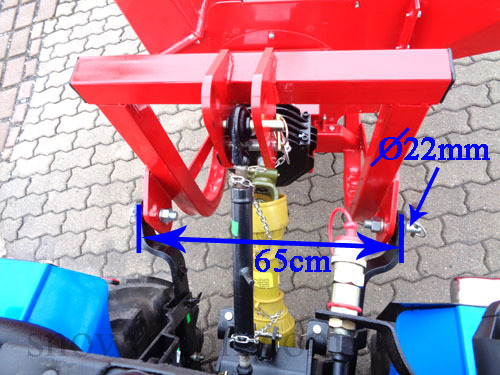 Press continue, then the auger runs backwards. 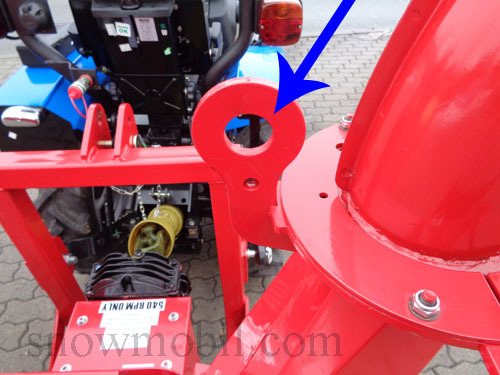 Press the curved metal completely backwards, the auger stops as an emergency stop. 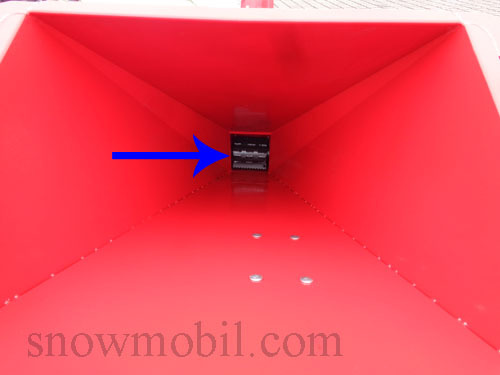 Thus, the blade disc rotates empty because no more chopper material is supplied. The lever on the side unlocks the emergency stop - you have to pull it only. 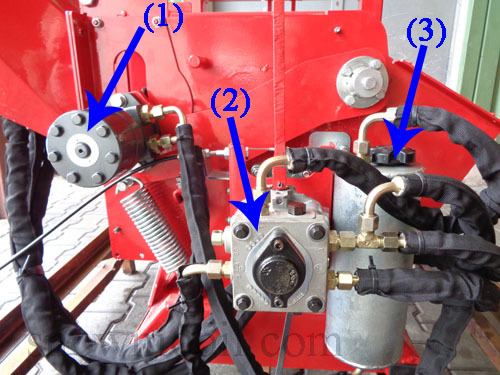 It is equipped with a hydraulic feed roller, the feed speed can be adjusted continuously. 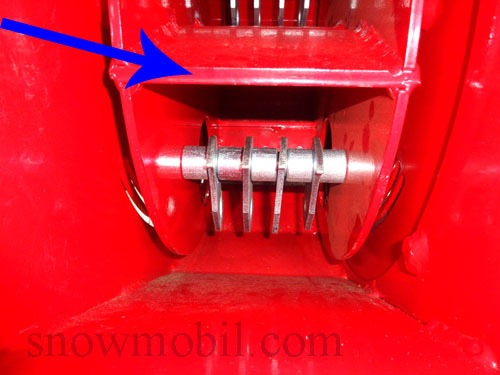 The shredder is equipped with 2 chopping knives and hammer-chopping mechanism. These two chopping-mechanisms work together in combination. 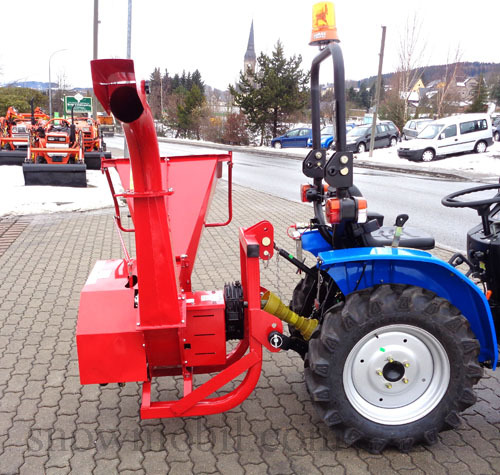 The chopped material is cut by means of two knives which are fixed horizontally on the chipper disc. 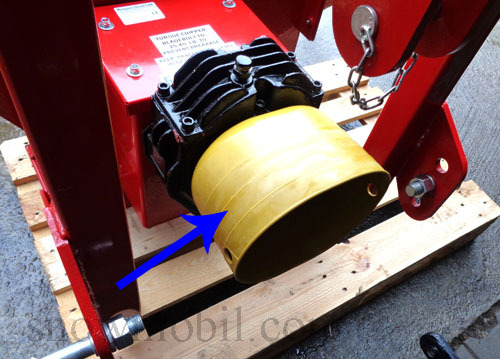 Thereafter, the chopped material enters the hammer chopper, and is then crushed again, Due to the high air suction which is generated by the hammer-chopping mechanism it is thrown outward. Due to the high air suction the chopper operating without blockage. Traditionally chippers of some competitors are built with a rotor disk with 2 or 4 blades mounted. 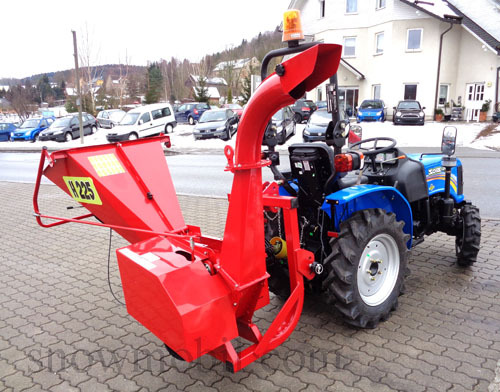 These chippers can chopp branches and logs without any problems, but has trouble with small branches, twigs, hedge trimming, etc. 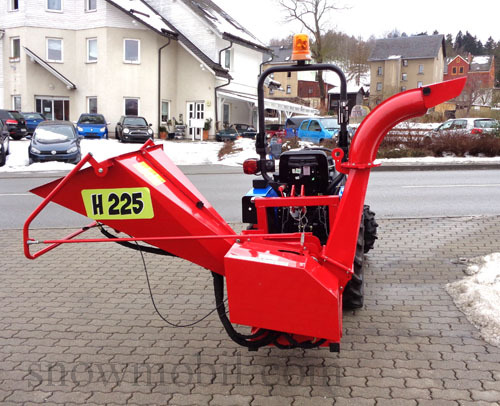 Our offered chipper H225 has a chopping mechanism with combined hammer and chipping knife and can shred branches up to 90 mm thickness without any problems. But also small branches, bushes, hedge clippings, twigs, plastic bottles, polystyrene, etc. handles this chipper by the excellent hammer-chopping mechanism. 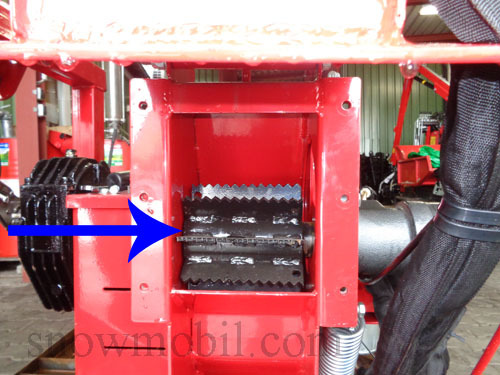 The 8 hammer blades are movably mounted on a shaft, thus these blades can fold back when obstacles occurring. Thereby, the wear is reduced. An inadvertent insertion of stones, wire and other unsuitable chopper material faces the chipper without prejudice. 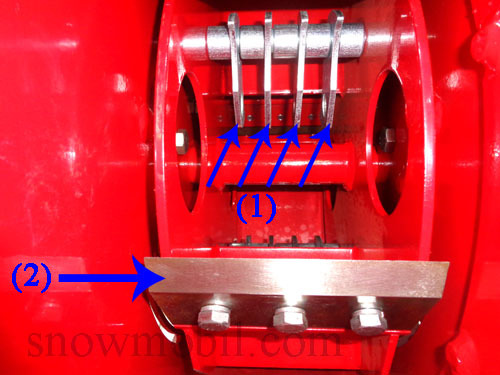 The power is transmitted by means of a belt that is permanently tensioned with a tensioner. 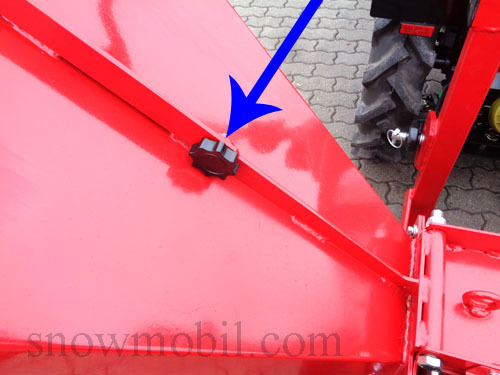 Here the hopper can be locked. The standard PTO is included. The chopper comes incl. PTO guard pot.